The following page gives additional information for both our subscription and membership options. Please contact us if you have any further questions and we will be happy to help! Subscribers and Members can access their account at any time by clicking here. Your account page will display your level of membership, as well as other options such as the ability to edit your profile, change your password at any time and also close your account if required. Your dashboard allows you to see all of our latest published pieces, latest comments and also a personalized profile page for styling and editing. Subscribers and Members can log into their account at any time by clicking here. Make sure you are logged in when trying to access any content relevant to your membership level. Please contact us directly if you are having any technical issues. We offer a FREE subscription option to visitors of our website. This is for those who are looking to receive more of our content on a regular basis and hope to explore some of the underlying topics associated with the public themes we cover! Subscribers will receive email notifications each time a new post is published on our website, as well as additional updates on what is happening with TOTT News. Subscribers will also receive access to Subscriber Content, which is material that gives our current subscribers a taste of our Membership Content, without the cost or commitment of a membership. Find out more about the benefits available to subscribers here. How do I subscribe to TOTT News? 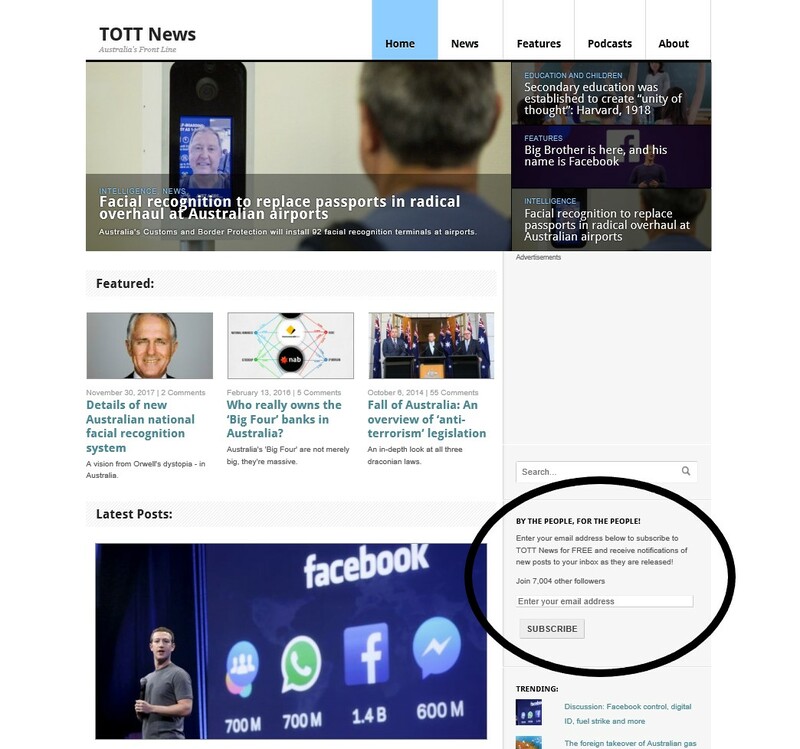 All you need is a valid email address to subscribe to TOTT News! To subscribe to our website, create a free account on our Registration page, by clicking the ‘Free Subscriber’ option and entering your details. This will create an account for you, with a personalized dashboard, so you can access all of our content. Alternatively, you can enter your email address into available sections on our website (PC | Mobile), and you will automatically be subscribed to our site and later sent an email with the option to create a free account on our website (optional). Note: The alternative option will not create an account for you automatically. You will still receive content and promotional emails, however will be unable to log into the site to access Subscriber Content until you create an account. Our Subscriber Content contains specific focuses from Membership Content, which looks to explore deeper questions relating to the themes we publish about. All original research, this content is best suited for those who want to learn more about some of the underlying topics associated with our themes and those who want to join like-minded people by staying up-to-date with TOTT News going forward in the information war. To learn more about the type of content included in our subscription option, visit our Membership and Content Information page. How do I unsubscribe from TOTT News? 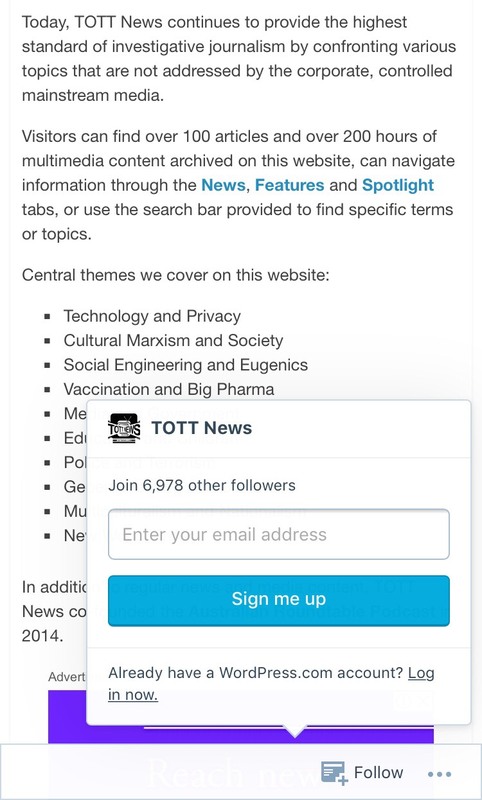 You can unsubscribe from TOTT News at any time by following the prompts on your account page or via options in your received emails. Alternatively, you can reach us directly with any problems and we can also remove your account if requested. Send us an email via our contact page! Not a subscriber of TOTT News? We also offer two Membership options here at TOTT News: Supporter and Full Member accounts, each for varying associated costs. A Full Membership option encompasses the inner-circle of TOTT News and it’s supporters, and is designed to serve as a small, online like-minded community. As a Full Member of our website, you will gain access to all of our Membership Content, which attempts to discuss and unravel most of the public themes we cover on our website. This includes additional extras, such as a Member Circle Podcast each month, first access to our content, the ability to pitch and submit content, and much more! A Supporter account is an alternative membership option, with less features, for those looking to support our work and learn more about our original research, without a full commitment. On this tier, you will still gain access to Member Content, however many other member features are not accessible at this level. 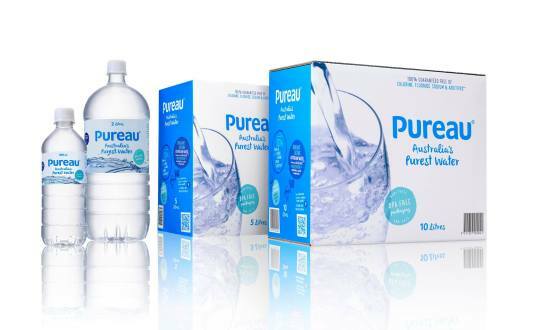 Find out more about our membership benefits, including pricing, by clicking here. How do I join TOTT News? All you need is a valid email address and payment system to join TOTT News! To join our website, head over to the Registration page and view both membership options available to you when joining. Once decided on a tier you would like to join, select the option and enter your account details accordingly! You will then be re-directed to a PayPal window for a secure, seamless transaction. After this is complete, an automatic account will be created for you, with a personalized dashboard, so you can access all of our content. 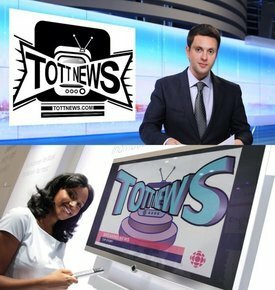 You will then receive a ‘Welcome to TOTT News!’ email within 24 hours to welcome you to the site, including all relevant information on what you can access moving forward! Find out more about our membership options by clicking here. Our Membership Content consists of original, hard-hitting pieces for supporters who are prepared to jump down the rabbit hole and discuss REAL information! All of the themes on our website interlock in a worldwide system, and the answers don’t lie with false narratives you have been told by false characters and organisations. We have been publishing for the better half of a decade now and our persistent search for truth in the age of open information has led us to ask some deep, deep questions. Our Membership Content is for those who truly appreciate the content we publish, and look to contribute ideas as part of a like-minded community! To learn more about the type of content included in our membership, visit our Content and Membership Information page. What is the ‘Member Circle’? Our Member Circle is the name given to the group of full members on our website, and is also the name of our monthly podcast available only to members. Our Member Circle consists of individuals who are highly engaged and even involved in our work. 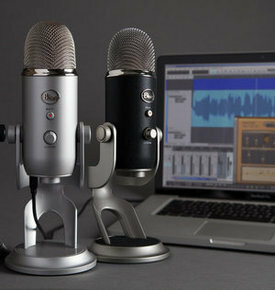 Our Member Circle Podcast is also broadcasted live and recorded via Google Hangouts! All new members to the website receive access to this fantastic forum immediately when joining, and will also have the ability to jump on the calls at any time they wish! Note: This feature is only available to Full Members of the website. Not a member of TOTT News? For more details about our subscription or membership options, including a look at our most essential reading, please visit our Content and Membership Information page!